Reductions in Force can be difficult to manage, and they also tend to move very quickly—making it very easy to miss a step or make costly mistakes in the process. The 16 Steps to successfully managing a reduction-in-force. The proper notifications and compliance schedule as dictated by the WARN Act —the Worker Adjustment and Retraining Notification Act—which affects most employers with 100 or more employees. 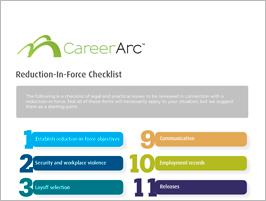 Reduction in Force Best Practices, such as how to communicate layoffs, prepare for possible legal claims, and manage fringe benefits obligations. Download our checklist and make informed decisions today that could affect the careers of your transitioning employees tomorrow.